With the intensity of Rivalry Week upon us and March Madness only weeks away, the hype surrounding not just college basketball, well mostly, but all college sports is heating up quickly. What better time than now to highlight the great traditions on campuses across the country? The passion and loyalty of the fans and students is second to none. If that doesn’t get you going, some of them are just flat out hilarious. This is one of those times when I wish I went to a big D1 athletics school. 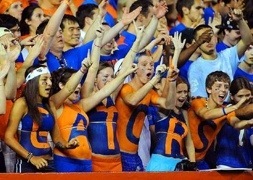 Anyways, OnlineColleges.net posted an article highlighting the best and funniest college sports traditions. I’ll give you a sneak preview at one of them below, but click the link below to check out the rest! This entry was posted in College and tagged boston sports blog, college, College Campus, College Chants, NCAA, Traditions by jtulz07. Bookmark the permalink.